Some people go to Costco to buy 30 rolls of Charmin; some go to buy a couple hundred Oreos in one package. As PCWorld's Serial Refiller, I go to Costco when I need cheap, easy ink--though the free food samples are a nice bonus, too. I can't afford to replenish my printer with the original vendor's printer cartridges, so I've set out to try third-party options--including remanufacturers, refill services, and do-it-yourself refill kits--and tell you whether the savings seem worth the hassle. In my experiences so far, the do-it-yourself refill kit offered the best cost per page and output quality, but caused the most mess. When I tried Office Depot remanufactured cartridges, they provided paltry savings and underwhelming output quality. Of the options I've looked at, Costco's onsite refilling service offered the best balance, saving me more than half the cost over the OEM's ink, with little effort and decent results. Refill vs. OEM: Who Will Prevail? Because I use each refill for just a brief period of time, and with only one printer, my ink refill experiences are anecdotal and do not test the durability or archivability of third-party inks, nor how the printer will fare after repeated use with them. Nevertheless, my hands-on trials will give you a taste of what to expect if you try a third-party alternative with your own printer. My test printer is an HP Photosmart e-All-In-One. For each evaluation, I start with a new set of HP cartridges, drain them, and then use them for the refill or for comparison with the remanufactured option. I use the standard-size HP 60 cartridges; the high-yield 60XL cartridges will last longer and usually save you more money. With both the HP and third-party inks, I print out a set of pages--ranging in content from plain text to a full-size color photo--over and over again until the ink starts to run out (blank streaks appear on the page). I count the number of pages that printed before streaks appeared, to get a sample page yield. These page yields will likely differ from those that HP or the third-party ink vendor quotes, just as your own mileage will vary depending on what you print. I also compare the print quality of the pages using third-party ink versus those printed with the HP cartridges. I have a Costco membership, mostly because I can't the resist the warehouse chain's free bite-size food samples. Scarf down enough burrito bites, pizza mini-slices, Louisiana hot links, and chocolate-coated almonds, and you've pretty much taken care of lunch--and your cholesterol count for the week. Recently I spotted a sign near the entrance of my local Costco advertising the store's Inkjet Cartridge Refill Service. The price was right, and Costco promised to refill cartridges within 1 hour. An ideal test for the Serial Refiller--and I could take a leisurely tour of the food booths in the meantime. To Costco's credit, both the brochure and the Web pages offer a lot of useful advice to promote a successful refill. 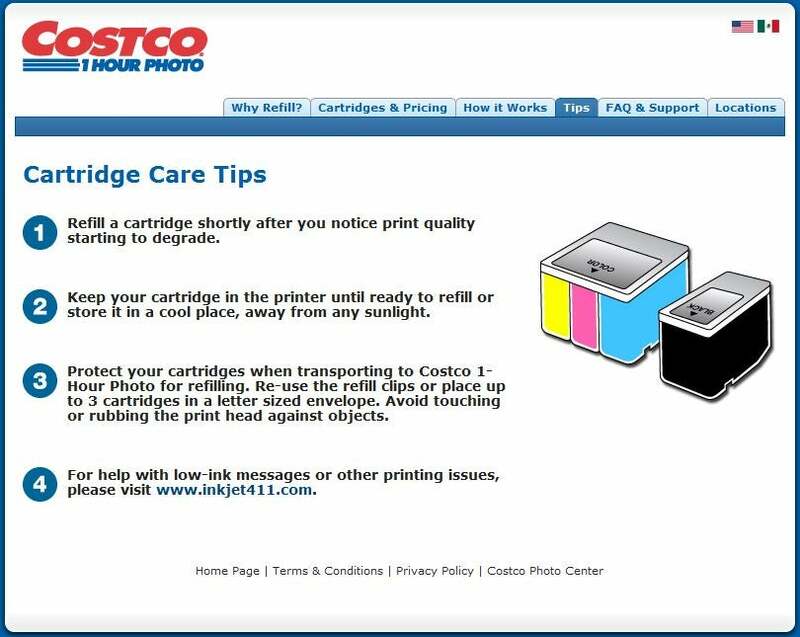 For instance, Costco recommends that you refill a cartridge as soon as its print quality begins to diminish. Costco also says that each ink cartridge is good for five to ten refills, depending on how well you care for it. The experience was painless. I brought a pair of empty HP 60 black and tricolor cartridges to my neighborhood Costco's 1-hour photo counter. I caught a glimpse of the big machine they use to refill cartridges, tucked in the back of the workspace. The clerk asked how long the cartridges had been dry, as dried ink can clog printhead nozzles. The clerk even dabbed the printhead area with a tissue to see if it was still damp--and it was, as I had just run out of ink earlier that day. Costco generally promises to refill cartridges in 1 hour, which proved true in my case. Pickup times may vary, however, depending on the number of cartridges you need refilled, and how busy the photo department is when you arrive. The Costco-replenished HP 60 tanks worked perfectly well. The printer filed the usual complaints once it detected the refilled cartridges, but I'm used to ignoring those by now. The prints that the Costco-filled ink cartridges created were adequate for everyday use. When I did a side-by-side visual comparison of the Costco and HP samples, however, the latter looked far better to me, with sharper text, brighter colors, and more realistic flesh tones. I dribbled a little water across both samples; each suffered some streaking and color bleeding, but Costco's ink did no worse than HP's. Costco promises to "closely match or exceed" the level of ink that comes in a new cartridge, and I found that to be true. I printed 148 of my sample pages with Costco ink before seeing streaks in images and text--that's 16 pages more than I got with HP's ink. Costco's refills will save you money, but how much, exactly? In my tests, the cost per page with Costco ink was 11 cents. In contrast, printing pages using the HP 60 black and tricolor cartridges costs 27 cents per page (if you buy the cartridges separately). A significant savings, indeed. Now the caveats. 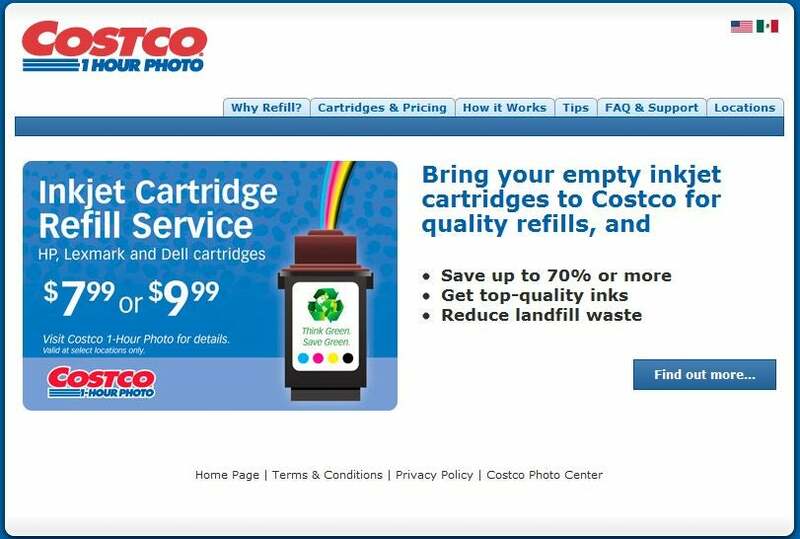 It certainly doesn't make sense to join Costco, which charges $50 or more for an annual membership, solely to refill ink cartridges. 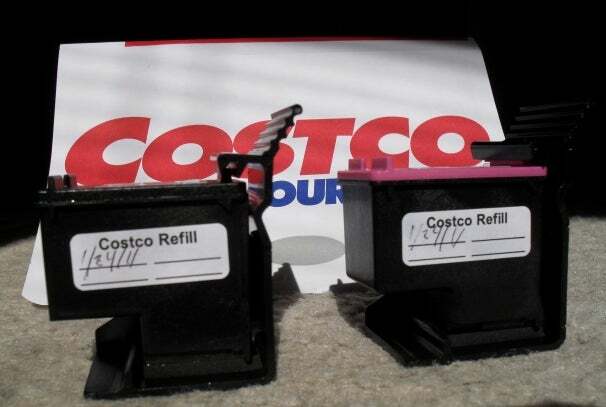 If you're already a Costco member, congratulations: You could save big on ink refills. Or you could join for the ink and buy other stuff there, too. Another option: If you print often and insist on using HP ink, consider buying HP's high-capacity cartridges, which hold more ink than standard tanks and can lower your cost per page. High-capacity cartridges don't make sense if you print infrequently, however, because printers that sit idle for extended periods require cleaning cycles that consume ink. A serial refiller will try anything to save money. Costco's cartridge-refill service is my favorite option so far. The Costco ink's output quality was not quite as good as HP's, but the refilling was so easy and so cheap that for me the trade-off was worthwhile. Stay tuned for my next refill experience, at a Cartridge World store--possibly near you.